“FREEDOM!! !” So shouted early 14th century Scottish freedom fighter William Wallace, as played by Mel Gibson in the epic 1995 film, Braveheart, as he went to his death at the hands of his enemies. Only Jesus could, and did, state that if one continues in his word, he would then know the truth, and that truth would set him free (John 8:31 and 32). He further declared: “If the Son sets you free, then you are free indeed” (v. 36). Here we see the constant correlation between the written Word and the Living Word, Jesus Christ, who was the embodiment of God’s Truth. The only true freedom is an internal freedom that comes from knowing Jesus Christ as your Lord, living in an intimate relationship with him, and allowing him to be your daily Savior from the sin that dwells in you. In The Living Truth Fellowship, we are doing our best to magnify Jesus Christ, the Living Truth, and the greatest freedom fighter of all time. Only he can deliver people from spiritual slavery, the antithesis of liberty. Every day can be “Independence Day”—if we are willing to GET REAL. Most people live in the delusion that they can make up their own reality, and even we Christians do too much of that. Hey, it never works because, by definition, reality is what the external world is presenting to you. For example, if everyone in your life says you are arrogant and insensitive, it might be worth considering whether or not you are. Or if you must have a drink each night in order to go to sleep, you might be an alcoholic. Of course you can always choose to book a quick trip to Egypt and live in de Nile, but that cuts y ou off from a solution to your particular situation. Remember, it is sin from which we need to be set free, sin and its inseparable accomplice, death. Practically speaking, when we allow sin to prevail in any aspect of our lives, it leads to the “death” of something good we could have had. Almost always, this regards the quality of a relationship we could have had with someone, and always hinders our relationship with the Lord Jesus. Is sin deceptive? Could 15 minutes save you 15% on car insurance? The most perfect word I know to describe sin is “insidious,” especially because sin is “inside us.” Insidious means: “intended to entrap or beguile; stealthily treacherous or deceitful; operating or proceeding in an inconspicuous or seemingly harmless way but actually with grave [as in death] effect.” A few synonyms: “corrupt, crafty, crooked, cunning, dishonest, disingenuous, duplicitous, ensnaring, false, foxy, guileful, like a snake in the grass, perfidious, perilous, secret, slick, sly, smooth, sneaking, subtle, surreptitious, wily, wormlike.” Yuk! No doubt you have read the Bible verses that talk about the innate ability we each have to “deceive ourselves” (1 Cor. 3:18; James 1:22; 1 John 1:8). That’s how deceptive the sin that dwells within us is—we can deceive even ourselves! How can we avoid doing that? By aggressively cleaving unto him who was tempted in all ways as we are yet who never failed to trust God to “have his back.” The key to facing the sin that dwells in us, and being aware of its many nuances without becoming discouraged by it, is to know our Lord Jesus and our righteousness in him. 11 Likewise you also, reckon yourselves to be dead indeed to sin, but alive to God in Christ Jesus our Lord. 12 Therefore do not let sin reign in your mortal body, that you should obey it in its lusts. 17 But thanks be to God that, though you used to be slaves to sin, you wholeheartedly obeyed the form of teaching to which you were entrusted. 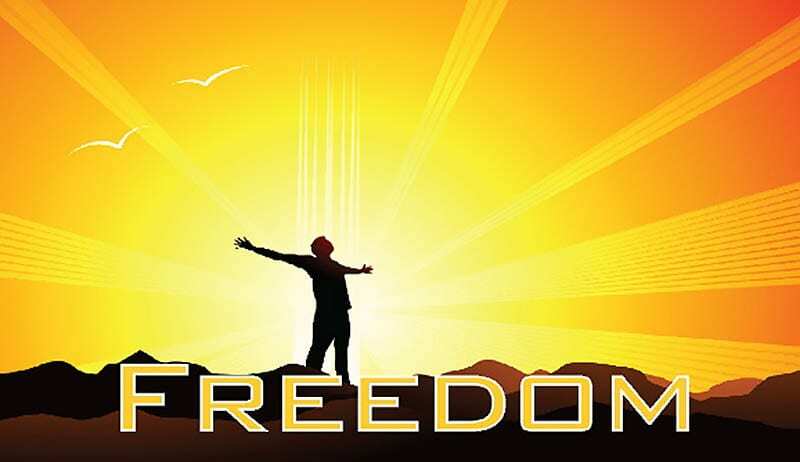 18 You have been set free from sin and have become slaves to righteousness. Jesus is a complete Savior from sin and death, including the sin that dwells within us. We must not allow ourselves to have the attitude of: “Hey, thanks for dying for me; I’ll take it from here.” But if I do not trust Jesus to “have my back,” that is, help me where I cannot help myself, I have no option but to try to save myself. How does that work? It doesn’t. Maybe we should have a couple of new Christian holidays: Dependence Day and Interdependence Day. I assert that dependence is the key to independence, which is the key to interdependence. Huh? Sure, think about it: only when we are totally dependent upon the Lord Jesus are we truly free (independent), and only then can we effectually interact with other saved sinners in the Body of Christ—interdependently. Does that remind you of any Bible verses? How about the following? 5 This is the message we have heard from him and declare to you: God is light; in him there is no darkness at all. 6 If we claim to have fellowship with him yet walk in the darkness, we lie and do not live by the truth. 7 But if we walk in the light, as he is in the light, we have fellowship with one another, and the blood of Jesus, his Son, purifies us from all sin. 8 If we claim to be without sin, we deceive ourselves and the truth is not in us. 9 If we confess our sins, he is faithful and just and will forgive us our sins and purify us from all unrighteousness. 10 If we claim we have not sinned, we make him out to be a liar and his word has no place in our lives. “This is how we know…” In other words, we look at the reality of our actions in order to determine the posture of our hearts. Doing so is painful, but productive. God says not to tolerate evil, but how often we do just that because we are afraid to speak up about it, for whatever reasons. Some years back I did a teaching called The Ministry of Reconciliation: Making a Difference. It’s too bad that the meanings of so many words become more negative through time, and that the first definition of “confront” is the one that comes to mind for most folks: an unpleasant encounter with someone. But the next two definitions are actually more accurate because they allow for positive confrontation also—like KISSING! What is the deciding factor in whether or not you are willing to receive reproof or correction from someone? I say it is knowing for sure that the person out there on a limb, risking your rejection, is FOR YOU. Think about the following words: “Thank you for caring enough about me to be honest.” Should not that be your first response to a Christian who is reaching for your heart with words to help you become more like Christ? To truly LOVE is to RISK. Sure, because you have no guarantee that your love will be received, and/or reciprocated, especially if it takes the form of “confrontation.” If you are at the place where you can fearlessly speak into people’s lives when you perceive they are off track, good for you. I’m not there yet, but I can still do it afraid, or nervously, or stumblingly—if I focus on the fact that I love the person and want God’s best for him. I just do it! When you are dealing with another Christian, you have leverage to speak into his life. How so? Because you know that he made Jesus his Lord, and that means he made a commitment to become like Jesus. If you perceive that his behavior is not in line with that commitment, the loving thing to do is remind him of his goal and ask him to consider whether his behavior is concomitant with it. Isn’t that what you want others to do for you? My dear wife, Elizabeth, often speaks wisdom and truth into my life (somebody’s got to do it). The other day she said: “The feeling of conviction in your heart means that you are hearing God.” My knee jerk response is to repel that feeling, which is when I must grab my mind and make it “tolerate the sense of my personal sin.” I can do so because “it is not I who do it [not the new me in Christ], but sin that dwells in me.” And Jesus will help me conquer that sin. Elizabeth is my best friend, and, by the grace of God, there are quite a few other brethren in Christ whom I count as true friends. Each one is a treasure, which I must be sure I cherish. Elizabeth has a plaque that reads: “A faithful friend is a strong defense.” First, I want to be a friend of God and Christ. I want to defend their honor, and speak up for them in the face of evil. Second, I want to be the kind of friend who doesn’t quit on people, even if they rebuff me, delete me from their life, or quit on me. Christian freedom fighters have the opportunity for a depth of camaraderie most people will never know. I pray that you are cleaving unto The Freedom Fighter, and knitting your heart together with others doing likewise.